Yu-Gi-Oh! VRAINS is the sixth Yu-Gi-Oh! anime series and the fifth main spin-off series, which began airing in Japan on May 10, 2017. It airs in Japan every Wednesday at 6:25 pm Japanese Standard Time instead of the usual Sundays as with previous series did. This series airs alongside reruns of Yu-Gi-Oh! ZEXAL as part of BS Japan's Yu-Gi-Oh! Duel Hour block. It later airs alongside reruns of Yu-Gi-Oh! 5Ds starting from November 2017. On June 1, 2017, Crunchyroll began airing the show with subtitles, which became available in American English, German, Brazilian Portuguese, and Mexican or Latin American Spanish. Future episodes will be simulcast. The English dub had a sneak preview at the end of a special screening of Yu-Gi-Oh! The Movie: Pyramid of Light in theaters where the first episode was aired; it airs in Canada every weekend day at 1pm on Teletoon - East starting from September 2018. 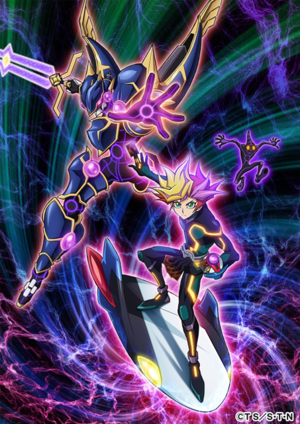 The series stars Yusaku Fujiki as the main protagonist, and takes place in a high-school setting, featuring Virtual Reality Duels in a cyberspace constructed with LINK VRAINS, the latest in virtual-reality technology. 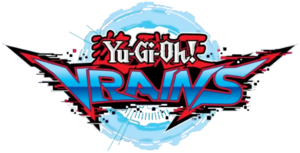 As with the previous three spin-off series (5D's, ZEXAL, and ARC-V), VRAINS introduces and focuses on a new type of Summoning: Link Summoning, though the second season gradually reintroduces the previous Summoning methods. Promo art of Yusaku Fujiki and "Decode Talker". The series is based in a world roughly ten years from now, where a massive Virtual Reality Network called LINK VRAINS has been established. It's a suspenseful, thriller-style story in which Yusaku Duels in order to learn the truth of the events surrounding his past. The sixth series focuses on Yusaku Fujiki, a high-schooler and a hacker who doesn't like standing out. However, he gets drawn into encounters with people as he tries out Dueling for once. There is a city where network systems have evolved: Den City. In this city, with the advanced network technology developed by the corporation "SOL Technologies", a Virtual Reality space called "LINK VRAINS" (Link Virtual Reality Artificial Intelligence Network System) has been developed. By using LINK VRAINS which was built inside the Network System, Duels unfold where Duelists change their appearance separate from their real life identities, and in this VR Space people became excited over the latest way to Duel. However, in "LINK VRAINS", a mysterious hacker group that hacks via Dueling has appeared: The Knights of Hanoi. Their goal is to destroy the "AI World" known as "Cyberse" that exists somewhere in the depths of the Network. However, there is one Duelist who stands against the threat to "LINK VRAINS". His name is "Playmaker". He has become famous in the Network World for crushing the "Knights of Hanoi" in fierce Duels, without mentioning his name. But the true identity of "Playmaker" is ordinary high school student "Yusaku Fujiki", who pursues the "Knights of Hanoi" that appear in VRAINS in order to find out the truth of an incident that happened in his past. The show's theme is "Take a step forward, and try! ", on the premise that kids should start to try things out instead of just giving up at the first try due to being overwhelmed by information. 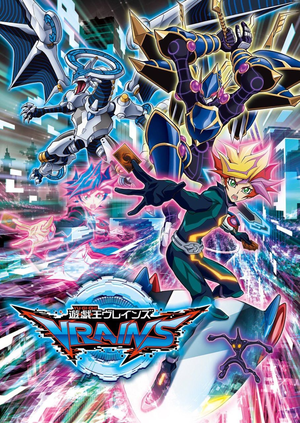 VRAINS is a combination of the acronyms VR, AI, and NS, standing for Virtual Reality, Artificial Intelligence, and Network System. The acronyms are displayed prominently during the English opening. As of episode 14, Masahiro Hosoda stepped down as director and was replaced by Asano Katsuya. It's to be noted that as of this episode, the backgrounds of LINK VRAINS and the Link Summoning methods were changed and added more detail, and the point gauge for Link Monsters depicts the monster's Link Markers. As of the same episode, the series is under the supervision of Satou Tatsuo (best known as the director of the Martian Successor Nadesico series). Production issues behind the scenes have forced the show to include a large number of "recap episodes", which the series has become notorious for. Asano Katsuya took to Twitter to apologize for these episodes after the fourth such episode; explaining that they were needed to allow them to slowly improve the series. ↑ 1.0 1.1 "The Organization | [VRAINS] Director Change". YGOrganization. August 16, 2017. Retrieved August 16, 2017. ↑ " The Organization | [VRAINS] Major Announcement of Details". YGOrganization. March 24, 2017. Retrieved August 16, 2017. ↑ "The Organization | [Weekly Jump] Yu-Gi-Oh! VRAINS Revealed!". YGOrganization. February 16, 2017. Retrieved February 16, 2017. ↑ "The Organization | [VRAINS] Further Character Info and Story Info". YGOrganization. May 6, 2017. Retrieved February 23, 2018. ↑ "The Organization | [Jump Festa 2017] Latest Information Stage: 6th Yu-Gi-Oh! Anime". YGOrganization. December 17, 2016. Retrieved December 17, 2016. ↑ "The Organization | [VRAINS] New Information from LABO (Week 3)". YGOrganization. April 19, 2017. Retrieved August 16, 2017. ↑ "Yu-Gi-Oh! VRAINS' Director Addresses Its Production Issues The Organization". comicbook/anime. February 9, 2018. Retrieved August 27, 2018. This page was last edited on 27 February 2019, at 11:33.